Our second child has a mind of his own and made his arrival 3 weeks before his due date. It was quite the eventful few days leading up to his birth, but in the end both of us ended up being doing well and not having major complications. We are so thankful that things were smoothly for his delivery and we all got to go home a day after his birth. This second pregnancy for me was fairly straight forward. I have been thankful to have boring pregnancies. The most excitement that this little guy gave us was some premature atrial contractions (PACs) during the second trimester, but thankfully he seemed to grow out of those. His due date was 2/16/19, but he decided that 1/26/19 was a better day to arrive. In the two days leading up to that Saturday, I had contractions throughout both days. The night before he arrived I spent the whole night awake with contractions, but they didn’t increase in intensity, they just persisted throughout the night and then finally spaced out some during the next day. I had experienced this with my first pregnancy, but they stopped, these contractions continued and I figured at this rate, we were going to have this baby sooner rather than later. I went to the OB on Friday morning (1/25/19) and I was 3cm diluted and 80% effaced. I went to work on that day and spent the day, slowly walking around and then managing contractions throughout the entire day. I had gotten our bags packed the night before, because I was awake, contracting and unable to sleep. That Friday night, I hung out with a friend, tried to relax and take it easy and then went to bed. I woke up around 1:50am with contractions that were stronger than the night before and they were consistently 5 minutes apart. After tracking them for 30 minutes, I woke up Chas, we grabbed our stuff, put William in the car and headed to the hospital. Thankfully Chas' parents had their phone nearby and we got in touch with them and they came over at 330am to stay with William. Chas dropped me off at the hospital, took William home and then came back to the hospital to be with me and help as we went through this labor process. Chas was amazing through the whole process! I have such an amazing partner and I am so thankful to have him by my side. He did a great job at organizing plans for William while we were in the hospital. William got to hang out with both set of grandparents and that was amazing. After arriving at the hospital around 245am, I was taken up to a Labor and Delivery room and then continued with contractions. We had an amazing L&D nurse, Stephanie who was so helpful when the contractions got stronger. She helped to press on my back and provided counter pressure, which helped make the contractions more bearable. I got up to try to use the bathroom some time around 630am and that is when my bag of waters bulged and then things started to progress quickly. Our little one arrived after several good pushes at 650am. There was a little excitement just before he made his appearance … he had gotten stuck and they realized that he had a nuchal cord x2 (the umbilical cord was wrapped around his neck twice). They were able to reposition him slightly to get that cord from around his neck and then he came right out! The NICU team was called, because they weren’t quite sure why he was stuck and they came right away to check out the baby. His initial apgar measurement was 1, which is quite low and he was floppy, but thankfully he perked right up and then had apgar’s > 7 after that. He didn’t need any oxygen support and was doing well and I got to nurse him and hold him within that first hour. 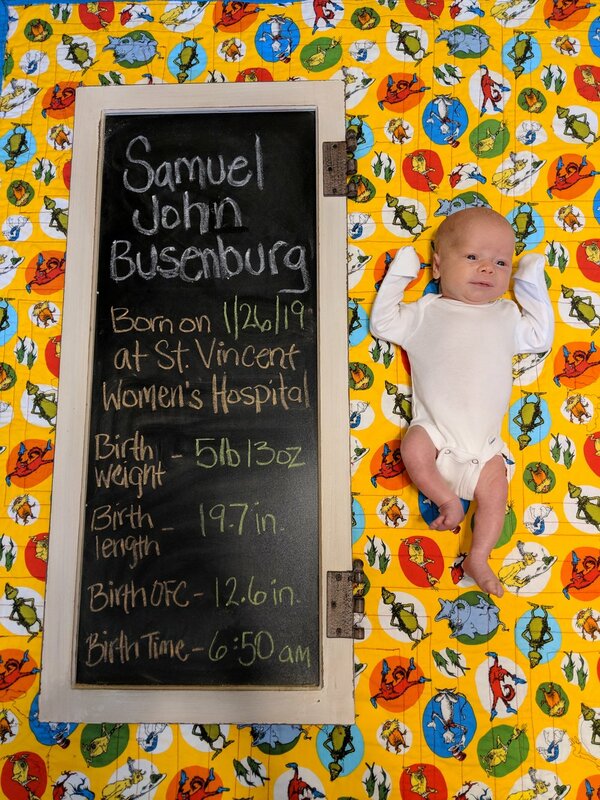 We named him Samuel John Busenburg. He ended up weighing 5lbs and 13oz and was a small little guy compared with William, but that is what happens when you arrive 3 weeks early. The healthcare team at Women’s was amazing! From the security guy who took me up to triage, the OB resident who actually delivered Samuel, our L&D RN and Postpartum RNs (both named Stephanie) and all the staff were fantastic. Samuel gave us a little cause for concern prior to discharge, because he wasn’t pooping. After some rectal stimulation and a glycerin chip, he ended up passing meconium, which was slightly plugged. He has stopped pooping since! I truly believe that God knew that Samuel needed to come early, because of his nuchal cord. If he had waited and grown more, he would have had a tougher time coming vaginally and who knows, I might have needed an emergency C-section. Thankfully everything worked out and we are so thankful for a healthy, strong baby boy who joined our family a few weeks early! It is hard to believe that I am almost to the end of the 2nd trimester with Baby Busenburg #2. Time has just flown by and I am pretty sure that is due to being busy and chasing an almost 2 year old around. I have been so thankful to feel good and be healthy during this second pregnancy so that is a huge blessing. I am currently 28 weeks along with Baby Busenburg #2. So that means we have another 12 weeks to go before getting to meet this little guy. That is just crazy, because I am not sure I am ready to embrace the life of motherhood with two children. This little one has a had a little bit of a hiccup when it comes to causing us to worry. At my 26 week appointment we heard some PACs (premature atrial contractions) when the OB was listening to the heart rate. This means the heart beat was off and there were some irregular beats happening. This is typically due to the heart being premature and that electric pulse running though the heart, not being fully developed. We are now going in weekly for heart rate checks and had another ultrasound. The ultrasound showed everything was anatomically fine so that is good news. This is an issue that normally resolves naturally and isn’t a huge cause for alarm. At my 28 week check, the PACs were less frequent, so that is a blessing. We just continue to pray that this little’s one heart continues to mature and his heart beats normally. Thankfully the lab work and glucose tolerance test were all good and those values were within normal limits. That was great news and that has been a huge blessing. I want to savor and enjoy all the moments with my boys (my husband, William and our dog, Einstein). I know when this second kiddo arrives, life is going to get crazy and I want to enjoy and appreciate our routine right now. I am going to work to figure out where we want to store this little’s clothes and diapers. He is going to share a room with William so I need to think through how I want to store his stuff so they can share that space. We are also going to try to figure out what type of toddler bed we want for William and what space will allow for in their room. We plan to keep him in his crib for awhile longer, but needed to kind of figure out what might work best for that space in the months to come. I will need to wash and pull out the newborn clothes and get those ready for this little guy. I need to read through the Bradley Method workbook from when I was pregnant with William I want to remind myself about the stages of labor and work to get ready for hopefully an uneventful, unmedicated 2nd birth process. We have a bassinet for this little guy, which is exciting, and I will just need to figure out where to put it in our room and where to set up a diaper changing station in there as well. Wrapping up projects at work. I will plan to work up until the day I have this baby, but I still want to work to get things organized and ready for my maternity leave. I plan to cook several dishes and get them in the freezer so that we can use them during my maternity leave and I don’t have to cook every day. Organize the two closets. I know that seems like a strange thing, but I find organizing things quite relaxing. I want to organize the hallway closet and William’s closet in his room before the baby comes. I would also like to do the same thing with the office closet. This is totally part of my nesting phase here at the end. I am planning on continuing to run/going to the gym these last weeks of pregnancy. That is something I did with William. I was running/doing yoga and using the elliptical more days a week with William, but I am just so much busier with having one child already I am doing good to get to the gym twice a week and then doing yoga at home weekly. I am so thankful for coming to the end of another trimester, only one left to go through and then we will have two little boys in our life to take care of. It is crazy and exciting. I know these last couple of months will continue to fly by. If you have been following my blog, you would know that I have been pregnant and writing up some blog posts about my experience. Trying to debunk some pregnancy nutrition/health myths along the way. A lot of people aren't familiar with what happens during pregnancy and so I was eager to share what I was learning with you all. Well my pregnancy finally came to an end on December 23rd. You may have seen on Instagram, we welcomed our first little baby into the world and his name is William. His birth story is rather boring, which is fantastic, because that is exactly what we wanted. If you want all the details on William's arrival into this world, let me know (some people might want to know more and I don't want to bore you) ... I will share the highlights with you here. Labor started around 6am in the morning. I was having some pre-labor contractions (they ramped up to 3 minutes apart and 1 minute in length) immediately. They lasted until about 730am and started to die down in intensity and lengthened out. But then by about 8am or 830am the contractions had increased again in intensity and were getting slightly stronger. I was scheduled to have an appointment with my OB that morning at 11am, but Chas called the office for me and they had me come in early. Chas was awesome at working to keep me calm. I sat in our bed this whole time, just trying to relax and ride the wave of each contraction. The more relaxed I was the less painful the contractions were. Chas finally got me in the car and we had all of stuff loaded in the car already. We then started the trek to the OB office and arrived there around 930am. My OB took a quick look and confirmed that I was dilated to 6cm and 60% effaced. She sent us directly over the hospital were I was a direct admit to the Labor and Delivery Unit. It was a wonderful experience being at St. Vincent Women's Hospital. Our birth plan was very simple ... a very hands off approach with minimal interventions as possible. I wanted to go through labor without any medicine (no epidural or other pain medication). I felt like this was something that I could do and would give my baby the best chance at a healthy delivery. I didn't want any IV fluids either. I worked out throughout labor to continue to drink water so that I wouldn't be dehydrated. I had an IV placed (per hospital protocol), but thankfully it never had to be used. I also wanted to make sure that at the end, once William arrived, if possible I wouldn't need any picotin. Thankfully, it all went well and I didn't need any IV pitocin administered. I also wanted the wireless fetal monitor, but unfortunately it broke the day before we arrived. I was able to go on intermittent monitoring - meaning I was on the monitor for 20 minutes of every hour. The nurses were great about only coming into the room to hook up and take off the monitor and check my vital signs. Labor was long. I knew it was going on for awhile, but thankfully I didn't have a good concept of time. Chas did a great job at protecting me from that. The total length of time that I was laboring was 20 hours. I have been told that is fairly common for your first child, but it was quite the marathon. Thankfully that was the biggest challenge. Towards the end of labor, we learned that there was meconium staining, which means the bag of water had meconium in it. If William would have aspirated any of this then that could have caused an infection and required intervention (respiratory or medication). Thankfully he came out crying, the NICU team was there was quickly assessed him and he didn't need any type of intervention. He did great and maintained a perfect heart rate throughout the 20 hour labor process. He welcomed a healthy, strong boy into the world at 1020pm that night on 12/23. It was wonderful to see him finally come out and that long, marathon of labor start to come to an end. We can't thank everyone who helped us throughout this pregnancy and during the labor/delivery enough. We had a wonderful experience at St Vincent Women's Hospital and were so impressed with the amazing care and support we received. We were so thankful for going through the Bradley Childbirth Classes to help feel more prepared for the long labor process. I am also thankful for keeping fit throughout the 9 months of carrying William so I was able to go through labor, exactly how I wanted. It was great to have done prenatal yoga through the entire pregnancy and I felt physically as prepared as I could be to bring a baby into the world. If you have any questions or want more details ... feel free to get in touch with me. I wanted to just provide a nice close to my pregnancy journey. Now I have embarked on my next adventure ... being a breastfeeding Mom. Don't worry there will be a few blog posts about that as well! It is almost time for our little guy to arrive. It is hard to believe as I am writing this that we are quickly coming to the end of this pregnancy. It feels like not that long ago, I was putting an announcement up on this blog. For all of you who have followed me on social media - Facebook, Twitter and Instagram you have most likely seen a variety of things about my pregnancy over the last 9 months. I wanted to take the time and just write up a little summary of my experience being pregnant and looking back over the last 9 months. Issues with Nausea - This was huge initial struggle for me. I am never sick and I really had issues with a lack of appetite, increased ability to smell things and some issues then with vomiting a few times. I tried a variety of things to help diminish these symptoms. I used Sea bands and they helped a little. I also made sure that I was eating something small every 3 hours (even over night). I would wake up and eat applesauce or crackers overnight. I found that I liked cold food items better than hot items. I also really struggled to eat vegetables so I didn't push myself to eat them. I also took a combination of Vitamin B6 and Unisom to help take the edge off of the nausea. This helped the most and really helped me be able to start eating again and be around food. Extreme Tiredness - I was amazed at how tired I was during these first weeks of being pregnant. I was wiped at the end of every day and I would get home and just sit or sleep. I was thoughtful for the chance to take it easy and just rest when I needed to, which helped a lot. Sacroiliac Pain - This started for me right away. I noticed pain in my hip/back when I would stand on one leg in the shower or when I was putting on pants. I started doing some research online and found a variety of exercises that would help. I also made sure that I had good posture to help prevent the pain from getting worse. I think getting on this problem before it got worse really helped me throughout the past 9 months. Started Prenatal Yoga - This was one of the best things I did throughout my pregnancy - every Tuesday night I did prenatal yoga. I absolutely loved it! In fact, I am going to really miss it when I am no longer pregnant. It helped my sacroiliac pain and helped just to move/stretch. I think it also helped maintain some strength, balance and flexibility which is important in labor. Totally Overwhelmed - This was a very overwhelming time and I am so thankful for a supportive and encouraging husband. Without him, I am not sure I would have had such a positive pregnancy overall and for that I have to make sure he receives all the credit that he is due! Return of Energy and Normal Activities - Getting into this second trimester was wonderful. I felt "normal" and like my regular self again. I had my energy back and I could do all the things that I would normally do - work, exercise, fit in errands after work, cook dinner and clean the house. I am the type of person that is always moving and doing something. I didn't exercise as much during the first trimester, because I was so tired, but I got back into my normal routine of exercising for about 30-45 minutes every day. Have the Chance to Travel - Since I was feeling better, it was great to take the time and travel some during this time frame. We went to Fort Wayne over the summer for a baseball game, got to travel to Ransburg for a couple of weekends and made a big trip out to the East Coast for a wedding. We enjoyed being able to see some family and friends. Labor and Baby Preparation - We took this time to make sure that we got as much done as we could prior to our little guy arriving. We put together our baby registry, re-organized our house to accommodate baby things, took our Bradley Method child birthing classes, and started to purchase some items for the baby/his space. We also took time for the two of us, myself and my husband. We wanted to appreciate and cherish all of this time that we had left with just the two of us. Monitoring Weight Gain/Counting Calories - This was very important to me to make sure that I was eating enough, but not over doing it. During the first trimester, I didn't gain or lose weight. I just maintained my normal and that was perfect. During this second trimester, I wanted to make sure that I didn't gain too much weight too quickly. To help provide myself with reassurance, I started counting my calories. This has been such a helpful tool to keep my weight gain appropriate. Continue to do most normal activities - As I moved into the third trimester, not much changed. I noticed that starting around 30 weeks gestation, I started to show a lot more and started to feel more pregnant. I have been able to still do most of all the things that I want to do. I still run, but the time has slowed and it has gotten harder. I ran two 5Ks during this trimester and I was so excited to be able to do that. I didn't win my age group, by any means, but I didn't come in last! To balance out my slower running pace and the increased toll on my body, I made a normal routine out of going to the gym and using the elliptical. This has been easier on my joints and still allowed me to be active. Started to slow down a little bit - In these last final weeks before Baby Busenburg's arrival, I have started to notice myself slowing down. I am bigger and he is growing well and I just take a little longer to move around. I notice that I get more winded when I go up the stairs and if I sit in one position too long, it is uncomfortable. These have really been the worst of my complaints. I have been so thankful for an uncomplicated and boring pregnancy. Eager Anticipation - I think both Chas and myself are getting more and more ready for Baby Busenburg to make his arrival. We are both as ready as we will be to start this parenthood journey and I know that I will be happy to have my body back. It will be lovely to finally see our baby's face, not be kicked randomly throughout the day and be able to sleep on my belly again. I know we will have lots of other new challenges to face, but I have an amazing husband who is going to be right there by myself the whole way! In lieu of Baby Busenburg's anticipated arrival at the end of December, my husband and I decided we needed to take some birthing classes. We are first time parents and obviously have never done this whole baby, birthing thing before. We wanted to find some birthing classes that were in depth and really outlined what we needed know and how the whole labor process works. St. Vincent Hospital offers birthing/baby classes, but unfortunately, that wasn't quite what we were looking for in terms of in depth knowledge. I have heard great things about the classes, but we really wanted to know all the details. This lead us to the Bradley Method. I had a co-worker that went through this class series back > 20 years ago and she found it extremely beneficial. I was able to locate an instructor on the northside of Indianapolis. This class series is normally 12 weeks long and it teaches you in depth information about pregnancy, the birthing process and even after delivery. The main goal of the Bradley Method is to deliver a baby naturally, without the aide of medications. This is a little different class compared with Lamaze classes (which focuses on just breathing techniques), because the Bradley Method emphasizes physical fitness and healthy diet to help support a healthy pregnancy and natural birth. This was in line with our goals with this pregnancy and hopes for delivery. The other main emphasis of the Bradley Method, is the husband assisted coaching. Both the Mom and Dad are involved in the classes and have roles. The Mom is obviously going to labor and birth the baby, but that whole time the Dad serves as the coach and provide encouragement for the mother. This was another key thing, we wanted from our birthing classes, support/encouragement for the Dad and not have the classes be only about the Mom. I just wanted to discuss this birthing method, because I think it is great and has been such a positive experience for us and lots of women out there are unaware of this birthing technique. I went ahead and compiled some information from The Bradley Method website summing up the process and how this technique is helpful to woman preparing for birth. This birthing method, teaches woman and their partners how to stay a low risk pregnancy. Obviously, there are things outside of our control, but there are a variety of techniques that can help set your pregnancy for success and to keep you as a low risk pregnant woman. Relaxation is a key component in this birthing method. Staying relaxed helps your labor to progress naturally and helps you, as the laboring mother, feel more confident in knowing what to expect and anticipate. This method also utilizes a birthing coach as well. This is a very important role and is normally filled by the husband or partner. This coach is there is to help support the mother and help protect her during this labor process. We liked this aspect of the classes, because we wanted both of us to be involved and it be a team effort. This birthing method encourages that idea of teamwork. I wanted to just share our birthing classes with you, because I think more people need to be aware of the different ways to give birth. It does not have to be a painful experience or something that you don't feel/remember. If you are a low risk pregnancy and want to have your baby naturally there are great resources out there to help you accomplish that goal. I believe that this is the best way to have a baby for the mom and for the baby. I really appreciated finding a birthing method that encouraged woman to be strong and encouraged their husbands to have a key role in the birthing process. If you have any other specific questions about the classes, feel free to let me know. We are wrapping up our class series next month and are so thankful for the time we took to attend the classes, do the homework and hope that come December, all the prep will pay off when Baby Busenburg arrives. Pregnancy Glucose Test ... What this means?! So if you have ever had a baby or know someone who has had a baby, you have probably heard about the pregnancy glucose tolerance test. This is a test that is done between 24-28 weeks gestation to determine if you body is properly utilizing glucose. If your pancreas is struggling to produce enough insulin to uptake the glucose in your blood stream from the food you have eaten, then you would be diagnosed with gestational diabetes. If you have already been diagnosed with diabetes prior to pregnancy, then you will not have to complete this test. What exactly in the glucose tolerance test? The test begins with you consuming a sugary, liquid solution that contains 50 grams of glucose. You have to consume all of this liquid within 5 minutes. Then you wait for 1 hour and you have your blood drawn to test your blood sugar (or the amount of glucose circulating in your blood stream). If this number comes back elevated, then you will have to repeat the study with a 3 hour tests, where you take the solution and have your blood drawn at the 3 hour mark to see what your blood sugar is and if it is elevated then you have gestational diabetes. So now that I have established what the glucose tolerance test is, I wanted to discuss briefly about what this test shows. As a dietitian at a Women's Hospital, we see a lot of women with gestational diabetes and some women that just missed the mark for being diagnosed, but they failed the 1 or 2 hour blood sugar checks. As a Registered Dietitian, who works with these babies in the NICU, I think that we need to do a better job at educating our mothers about a healthy diet/lifestyle even if they just barely passed their glucose tolerance test. Often, if you pass it, then you physician doesn't really focus on diet or exercise and lots of Moms just assume they can continuing eating whatever and it won't have an affect on their baby. There was an article that I came across from Health Day talking about how diabetes during pregnancy can produce negative outcomes for your baby. This research was released at the European Association for the Study of Diabetes in Germany this week, I thought this was a well timed article and good for mothers to be informed. Your health, as the mother, has a huge impact on your child's birth and health outcomes. This is important for us to remind pregnant woman, that your health matters and making the effort to watch what you eat not only is helpful to you, but also your unborn baby. Hopefully some of this information is helpful and you can share it with a pregnant friend or family member. I am had the chance to participate in my very own glucose tolerance test this past week and thankfully I passed with flying colors. All my blood work came back great and that was a huge relief. It is nice to be reassured that things are going well! If you have been following my blog for any length of time, you can tell that I have started to post more about pregnancy nutrition/wellness since I, myself, have become pregnant. I know that is kind of self-serving, but I do think it is great information and I am just excited to share with you all credible information. I have been trying to space out the pregnancy information, with posts about cooking, running and general wellness topics. If there is a certain topic you want me to research further/more in depth, let me know! Ok ... so pregnancy weight gain. I have talked about this before in previous posts, but I wanted to talk specifically about it now in regards to how you gain weight. This was a topic that I was very curious about and wanted to dig deeper. In between 22-25 weeks I started to notice that my weight really started to jump up, from ~142lbs up to 147lbs in just a matter of weeks. I have been eating well, counting calories, exercising 3-4 times per week and walking throughout the work day to help my back and stretch my legs. I feel great otherwise, but the scale numbers were really jumping up. I was given a heads up that this might happen from a co-worker. She had mentioned that she noticed this fluid shift around 25 weeks gestation. I started to do some more research and I found a great write up on Expecting Science that explained how this weight gain occurs in the 2nd trimester. We know current pregnancy weight gain guidelines (2009) are as follows: 25-35lbs for a normal weight woman, 28-40lbs for underweight woman and 15-25lbs for an overweight woman. This sounds simple, but ends up being more complicated in terms of how this weight is gained. A lot of the weight gained during the 2nd trimester is water weight. There is a large fluid shift that occurs and by the end of the 2nd trimester, mothers have doubled your blood supply. That is a huge fluid shift and that increasing scale number is more likely fluid compared with fat accumulation or even baby's weight. Pregnant women also don't gain weight neatly week to week. All of us gain/lose weight at various rates and often it is not consistent. So a large increase over a couple of weeks isn't surprising, especially if weight gain was low in the weeks prior. I thought this graphic was a huge help in better understanding pregnancy weight gain. As you can see about 20 weeks gestation the mother's blood supply really started to increase and the weight of the uterus and breast size also increases. As anticipated, during the 3rd trimester the baby's weight increases and that starts to be the main growth area that occurs prior to delivery. Making sure that you are aware of your weight gain, and keeping track of it is important. Your weight gain might also not be completely predictable. That is ok! If you are looking for additional information for weight gain recommendations then read this short article from Pregnancy & Newborn. They touch on weight gain during pregnancy and even losing weight afterwards. Your body is an amazing thing and its ability to adapt and grow is really neat, even if it feels slightly unpredictable. I have felt this "need" to write up a blog post about pregnancy nutrition. As a now pregnant woman, I have heard so much misinformation about pregnancy nutrition that I kind of want to address a few of these issues. I have always felt as a Registered Dietitian that it is so important to have all the scientifically accurate facts when it comes to your health. So hopefully you find some of this information helpful and insightful for yourself or someone that you know who is pregnant. "You are eating for two" This is one of the most common things that I have heard lately. Unfortunately I don't believe that as a pregnant person you should be operating under this assumption. Not until your third trimester should you be increasing your calorie intake significantly. 1st Trimester - do not consume any extra calories. Continue to eat your normal, healthy diet. Nausea is often challenging at this time so finding foods that sound appetizing is important. Try to balance your fruit/vegetable intake and make sure to aim for small, frequent meals if nausea is an issue for you. 2nd Trimester - it is recommended to consume an additional 340 calories per day. That is not a lot of extra calories. If you enjoy sweet treats, that could easily just be 1 donut or 1 Starbucks drink a day worth of calories. To help keep our calories under control, it might be helpful to count your calories. I have been using MyFitnessPal to help keep tabs on my calorie limits per day. Also continue to be active and make sure that you are exercising on a regular basis. 3rd Trimester - this is where your baby ends up growing the most. You need an additional 450 calories per day. Make sure that if you are adding calories, you are choosing healthy food items to increase your intake of - fruits, vegetables, whole grains, lean protein and dairy options. Keep up on activity during this trimester as well. As you increase in size, some activities can be challenging but do what you can and try not to become a couch potato. "Pregnancy cravings are a thing" Now this is a comment that causes a lot of contention among people. I think that lots of time, people use this myth as an excuse for their excessive weight gain. We, as people, have cravings and have foods that we really love. For example, I got some Albanese gummie bears and they are weak spot for me. I love them and I could sit and eat the whole package. I know this though and I choose most of the time not to buy these "trigger foods." It is not that I am pregnant that I want them, it is because I find them delicious and I have always had a weak spot for them. I have also had certain foods that during pregnancy sound more appetizing than others. I have really grown to LOVE bacon recently. Again, I don't think that this is a craving or a food item that I eat excessively. I think that mindful eating and maintain moderation is the key to success in life and in pregnancy. "Your baby will get whatever nutrients it needs from you, so what you eat doesn't matter" There is a grain of truth to this myth. Your baby needs certain nutrients and if you are not eating a well-balanced diet, the infant will try to obtain these missing nutrients from your body. Calcium is a great example - if you aren't consuming enough dietary calcium, your unborn baby will start to pull calcium from your own bones to meet their growth needs. Now with that said, your diet as the mother, if very important. You need to maintain your own health and meet the needs of your growing child. What you eat has a huge role to play on your child's overall health (in utero and after they are born). For more information about maintaining a healthy weight during pregnancy, check out the Academy of Nutrition and Dietetics website. One of the biggest challenges for pregnant women is to maintain a healthy weight. This has a huge impact on their own pregnancy and their infant's health. Take the time to make this a priority and if you have additional questions, let me know! So as you probably now know my husband, Chas and I are expecting our first child in December. It was been a crazy ride so far, but as I head into my 2nd trimester it is wonderful to start feeling better and more like myself. I would say that I am a very active person. I enjoy running and doing yoga. I am sure you can tell from my blog that I enjoy being active and can not sit still for too long. With the start of this pregnancy I really struggled with feeling exhausted, nauseated a lot of the time and just lacking that normal vigor for life that I possess. Now I feel like I have come through that and am on the other side. I am starting to feel better and more like my normal self again. I have been getting back to running, which has been fantastic and I have made the commitment that I want to regularly attend prenatal yoga classes. For all of you who are pregnant, this definitely pertains to you! I am a strong believer in balance of one's self physically. I think that yoga really helps to accomplish that. You should never do just one type of activity or motion repeatedly so added variety and balance to our routine is important. I know I can tell a huge difference in my own body's alignment when I sit a desk all day or on the coach. I can feel it in my back and doing yoga helps to stretch and strengthen my body. So maybe you are pregnant and we have never done yoga or you aren't conceived this could be something that could help you. Your body needs and gets more support - With pregnancy your body changes A LOT. Even in ways that you can't see. Your body releases a hormone, called relaxin and this makes your ligaments more stretchy. It is help with labor in the future, but this hormone is released early in pregnancy (~10 weeks). This can cause some pain or movement into joints. Your body requires more support now with pregnancy and doing exercises that promote balance and support will be helpful. Learning safe ways to stretch, strengthen and support your body will be helpful as your body continues to change over the next 9 months to support your growing baby. Strengthening important muscle groups - Prenatal yoga helps to strengthen your pelvic floor, hips and abdominal muscles which will be stretched and pulled in the labor process. The key to keep these muscle group toned - meaning a proper balance between the length/strength of the muscle. This will help with supporting your growing baby, laboring for multiple hours and for recovery afterwards. Better prepared for labor and delivery - Yoga teaches mindfulness, proper breathing and a sense of relaxing. This is helpful in the labor process, because we all want to tense up, be slightly afraid and this will make labor more difficult. Using techniques learned in yoga to do cleansing breathes and to stay calm will help with the flow and even the duration of labor. Connectedness with your baby - Taking the time out of your busy schedule for yourself and your baby helps with feeling connected to this little one growing inside of you. This is also a place to meet other mothers and have a sense of camaraderie with those in class with you. During the class there is lots of mindfulness towards your baby and taking a moment to think about them. Healthier overall pregnancy - Research is showing that mothers do practice yoga tend to have less preterm infants and have a lower chance of having a low birth weight infant. Yoga counts as a form of physical activity and we know that maintaining your physical fitness during your pregnancy leads to better outcomes for yourself and your child. Hopefully some of these benefits to doing prenatal yoga have started you thinking about maybe joining a class in your local area and becoming more physically fit. I know that participating in prenatal yoga classes (that last over an hour) helps to calm me down after a stressful day, my whole body feels better and I have a much more positive outlook on life.